For over 150 years, from novel to stage to screen, the image of the child Cosette has become a symbol of the Victor Hugo's classic. Victor Hugo, author of "Les Misérables". Since Victor Hugo's sprawling novel was first published in 1862, while the author was in political exile in Guernsey. it has remained in print and has been translated into dozens of languages. 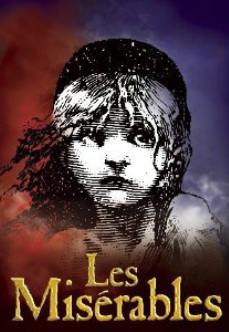 Versions of the novel have been produced as plays, as a famous musical and at least a dozen movies based on Les Misérables have appeared as movies and television series. Tom Hooper's 2012 movie is based not on one of the earlier movie versions, but rather on what was originally a French musical concept album (like Jesus Christ Superstar) that was inspired by Hugo's novel, by Alain Boublil and Claude-Michel Schonberg. The album, released in 1980, featured the now iconic Bayard illustration of Cosette with her broom. The success of the album led to its transformation into a stage musical in Paris. Two years later Peter Farago, a Hungarian director, took a recording of that show to London to Cameron Macintosh, who recognised its potential (although he couldn't make sense of the lyrics). Macintosh formed a creative team with directors Trevor Nunn and John Caird. The poet James Fenton was originally the lyricist but he was replaced at a late stage by Herbert Kretzmer. The resulting musical became a world-wide success. Hugo's huge novel (1230 pages in the Penguin Classics edition, which is slightly abridged) was an immediate success in France, the Continent and the English-speaking world. Its dramatic background, sentimentality, epic scope and fascinating characters, as well as its themes of redemption and social justice almost inevitably resulted in at least a dozen movie versions having been made, as well as several television productions. The dramatic events of Hugo's story make for ideal adaptation in other media. Scene from one of the countless stage productions of the musical version. 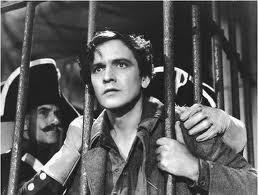 French actor Gabriel Gabrio who played Jean Valjean in the 1925 version. (Photo does not show him in that film). The first movie based on the book was released as a silent film as early as 1909. Another silent French version was released in 1925, followed by yet another French silent adaptation four years later. Little is known about the background of the 1925 adaption, except that it was about 370 minutes long and released in three sections, possibly over a period of weeks. It starred Gabriel Babrio who, after failing to become a Hollywood star in the late twenties went on to become a mainstay of French cinema for a couple of decades. The movie's director was Henri Fercourt. Some film archives have prints of some seaquences of the movie.. 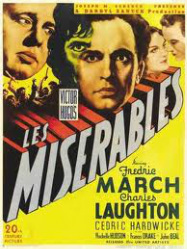 In 1934 one of the most famous (some claim the best) cinematic versions of Les Misérables was also produced in France. 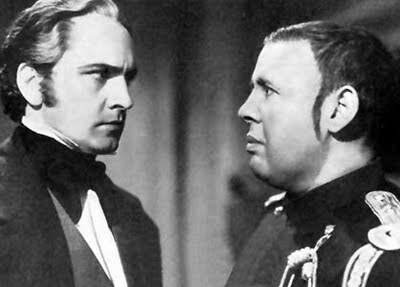 Directed by Raymond Bernard and starring Harry Baur as Valjean, (he won an Academy Award for his performance, and was killed by the Gestapo during World War 2), the five hour film was released as three movies over a three-week span. Those who have seen the movie praise its fidelity to the novel's main plot-lines and its ability to combine exciting action sequences with convincing moments of personal drama and emotion.Its superb cinematography (Jules Kruger) and art direction are also impressive. Poster for the 1934 version of the novel . This film is still claimed by some to be the finest cinematic version of "Les Misérables". 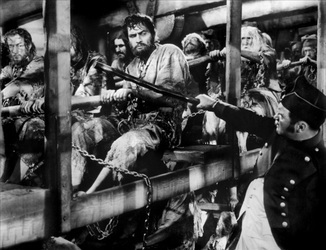 In 1935 Hollywood produced its own version of Les Misérables, featuring two stars of the era, the rather stolid Fredric March and the great scene-stealer Charles Laughton as a Javert in a performance not notable for its restraint.The main flaw of this movie lies in its heavy-handed omission of key sections of the book's plot and several of its important characters as well. The social issues fundamental to the novel are also downplayed. Yet it is still fondly regarded by many. In 1952 Hollywood attempted Les Misérables again, this time with Lewis Milestone as director. Like the 1947 version, large parts of the novel's plot do not make their way on to the screen. The film's 102 minutes duration is insufficient to supply the depth and detail required in any film version of the novel. Three of the movies' leads -Michael Rennie, Debra Paget and Edmund Gwen lack essential charisma, although Robert Newton makes an interesting, embittered and intense Javert. But this is a movie that is stolid, fragmented and lacking in emotional impact. This 1957 French-Italian production was the first wide-screen and colour cinematic version of the novel, but it suffers from very conventional, static direction and a lack of enterprise and imagination. 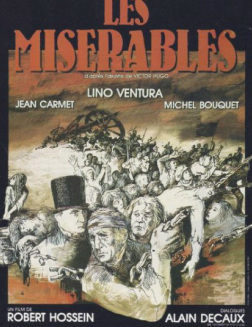 However, it does benefit from two excellent performances: Jean Gabin gives his interpretation of Valjean an impressive gravitas, and Bernard Blier's Javert is convincing as a dertermined, reelentless Javert. In 1980 the French stage and film actor-director Robert Hossein produced the first stage musical version of the concept album of Les Misérables. Two years later he directed a non-musical movie of the book, one which adhered fairly closely to the novel's plot. Almost 200 minutes long in its French version, Hossein's movie was applauded for its deft outlining of the complicated plot, well-judged depiction of characters, and a refusal to wallow in sentimentality. The overall impression left by this movie was one of vigor and integrity. It acknowledged the popular aspects of Hugo's novel but also examined sympathetically the book's social and political concerns. Director Robert Hossein was best known for his art-house movies which often grappled with the nature of guilt and responsibility. His cinematic interpretation of Hugo's novel managed to capture boith the book's epic sweep and its scenes of intimate emotions. The 1982 movie's publicity campaign shrewdly provided a brief resume of the film/book's main characters. This 1995 French movie, directed by Claude Lelouch and starring Jean-Paul Belmondo, is a must-see. It is a moving and insightful adaptation of the novel which cleverly transposes Victor Hugo's themes into the twentieth century, especially France under Nazi occupation. The very features that give the novel its emotional and intellectual heft - the nature of tolerance, justice, revolution, love and humanity - also occupy a prominent place in Lelouch's movie, but the new perspective offered by the movie gives them added resonance. The intriguing adaptation of the plot begins with the hero's father,Henri Fortin, wrongly convicted of murder is imprisoned and makes persistent attempts to escape. His wife and young son, are left destitute when the father dies in prison. The boy's mother is forced into prostitution, the son consumed by grief. When the scene shifts to Occupied France we see another husband and wife, the Zimans, Parisian Jews desperate to escape France. The husband promises Fortin, now middle-aged, a former boxer and now owner of a van, to drive the pair to Switzerland. In return, on the journey Ziman will read Les Misérables to the illiterate Fortin, who has seen and admired the 1934 film version in the cinema. Gradually Fortin comes to equate himself with Jean Valjean and to assume the heroic integrity of the fictional character as he tries to help the Zimans excape their Nazi pursuers. Lelouch has emulated the book's epic social scope by setting his scenes in a variety of physical and social contexts: prison, high society, the world of professional boxing, French collaborators, train robberies.Although the film lasts for three hours and has more than a hundred speaking parts, the story is clear, the characters are precisely delineated, and the film has an irresistible momentum. Bille August's 1998 version of Les Misérables is a puzzle. The Danish director made his reputation adapting popular fiction and literary classics, and demonstrated an ability to examine personal and social elationships against a period background. With this film he was working with a fine cast, which includeded Liam Neeson as Valjean and Geoffrey Rush as Jobert, along with two powerful feminine leads in Una Thurman and Claire Danes as well as good production values. Some US critics praised the movie. The New York Times called it "serious and intelligent", and praised its fidelity to Hugo's story and intentions. Yet there are significant omissions of plot and characters, the film comes to an abrupot and unconvincing conclusion and its two hour time-span seems inadequate to convey the novel's sense of the passage of a turbulent era. And despite the talented leads, the main characters seem to lack conviction. Audiences agreed - this version was a box-office failure. Statue of a grisette in Paris - historians now regard such young working-class women as pioneers in the French feminist movement. Fantine occupies relatively few of the 1200 pages of Hugo's novel, but she is a crucial and beloved character. The book -and some movie versions - label her as a "grisette", a category of early to mid 19th Century young working women, feisty, independent and dismissive of convention. But the Fantine of the stage musical and its 2012 movie adaptation is hardly the Fantine of Parisian social history. Ann Hathaway as Fantine. Annie Leibowitz's photo and the actor's portrayal fail to capture the shrewd, independent. go-getting spirit of grisettes.